Celebrating Zubin Mehta, long-term music director of the New York Philharmonic. 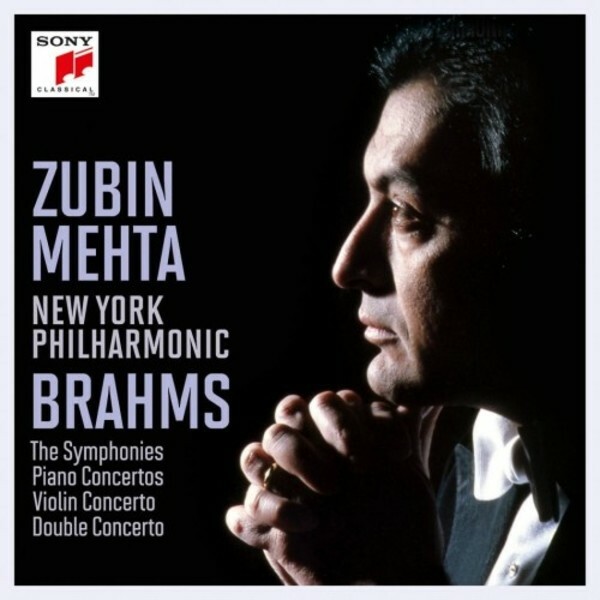 First CD release of Mehta’s Brahms symphony cycle of 1979–1982. All Brahms’s concertos recorded with Daniel Barenboim, Pinchas Zukerman, Isaac Stern and Lynn Harrell. An 8-CD edition with Symphonies 1–4, Haydn Variations and Academic Festival Overture newly remastered from the original tapes. Facsimile LP sleeves and labels, booklet with full discographical notes. Zubin Mehta’s Brahms cycle appeared on LP between 1979 and 1984, but it has never been issued before now on CD. In fact, the recording of Symphony no.1 – probably for contractual reasons (Decca had recently issued an LP of the First with Mehta conducting the Vienna Philharmonic) – was not released on LP at all. Needless to add, every item in this 8-CD box – featuring facsimile LP sleeves and labels, plus full discographical notes – has been newly remastered from the original tapes.